Back to School | What’s cookin’ at Tahoe Truckee Unified School District food and nutrition services? TTUSD continues to offer whole grains, veggies and fruits for nutritious school meals. TTUSD works hard to provide plenty of fruits, vegetables, whole grains and healthy entrees in our school cafeterias to ensure our kids are properly fueled and prepared to learn. The great news for students is that the new requirements in the USDA’s “Healthy, Hunger-Free Kids Act” allows the school district to further enhance the nutritious meals and snacks we currently offer. Increasing the amount of fruits and vegetables offered at breakfast from ½ cup to 1 cup daily. Reducing the sodium in both breakfast and lunch. Setting calorie limits for the first time for breakfast. All grains offered at breakfast and lunch will be whole grain. Daily we offer a variety of fruits and vegetables, sourced locally as much as possible, to give students more options so that choosing fruits and vegetables will be easy and appealing. Salad bars were piloted March of 2014 and will continue in the new school year to provide a variety of fresh, healthy choices for all students. With the support of the “Let’s Move” campaign sponsored by the White House and Whole Foods Foundation, TTUSD was awarded 10 new salad bars this summer! This means all TTUSD schools will offer healthy salad bars for our students. TTUSD also offers a program called “Second Chance Breakfast (SCB)” at each school site. SCB offers students breakfast at break time if they missed breakfast before the start of school. Breakfast before school starts, second chance breakfast and lunch are offered daily to all TTUSD students. We look forward to expanding our successful partnership with TTUSD Green Teams and the Facilities Department to expand reusable utensils and trays to all school sites, further reducing our impact to the environment. The Harvest of the Month produce will be featured every month for students to enhance their experience from the classroom to the cafeteria. 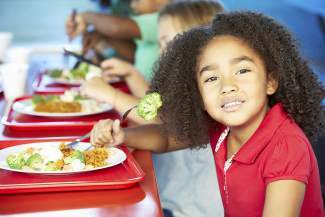 TTUSD makes it easy for parents to sign their children up for TTUSD’s food services. Families may access their student’s account online to make payments at http://www.myschoolbucks.com. School meal applications are online for free school breakfast and lunch eligibility. Please visit: http://tinyurl.com/kwaspx5. To learn more about the TTUSD Food & Nutrition Services and to get involved with child nutrition activities in our district visit http://www.ttusd.org. Kat Soltanmorad, RD is the Director of Food & Nutrition Services for TTUSD. Contact us at 582-2528, or email ksoltanmorad@ttusd.org.